Unfortunately, my computer is on the fritz and so will be out for repairs today. With luck, the problem is only a minor one and I'll be back up and running again this evening or tomorrow, but I have no way of knowing at this point. 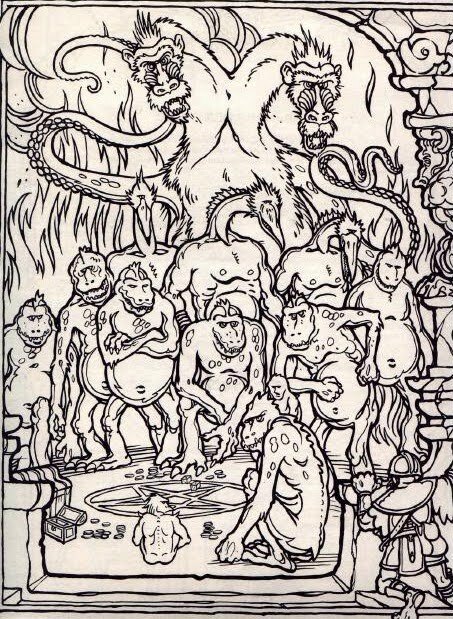 So, until I get back to regular posting, I leave you with this picture of demons -- including Demogorgon -- gambling from the Official Advanced Dungeons & Dragons Coloring Album. Much cooler than Dogs Playing Poker. I hope your machine is up and running soon. I think that poor adventurer just left a little something in his pants. I love the almost woodblock quality of that picture. Thanks for posting it. Pity I don't live anywhere near you. I'm a computer guru, and I'd fix yours for free. Not a fanboy, just a fan. I'm just curious about the term "coloring album"...is that some devious way to make it sound more serious and adult than what it really is: a coloring book? Sort of like calling comic books "graphic novels"? "Coloring album" often meant that the pages were intended to be removed from the book and turned into posters. BTW, notice the figure in the foreground crouching in front of the low wall? I can almost hear him saying "guys, I think they saw me". James, many thanks for helping recruit followers for my lord and master Demogorgon. You shall be rewarded in the afterlife. I remember as a teen having fun playing the mini game in the book with my girlfriend. And yeah, I colored my copy. 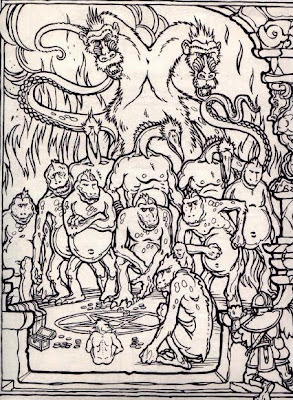 I love how that picture has medieval woodcut look, the sort of stuff you would expect to find on musty occult tome. I still have this book, and have colored it on and off over the years. I'll take some pictures and post them. I LOVE this style!